The protein in quinoa is remarkable. It contains more protein than any other grain; an average of 16.2 percent, compared with 7.5 percent for rice, 9.9 percent for millet, and 14 percent for wheat. Some varieties of quinoa are more than 20 percent protein. Quinoa’s protein is of an unusually high quality. It is a complete protein, with an essential amino acid balance close to the ideal … similar to milk! Quinoa’s protein is also high in lysine, methionine and cysteine. This makes it an excellent food to combine with, and boost the protein value of other grains (which are low in lysine), or soy (which is low in methionine and cysteine). This ‘salad’ has such clean, fresh flavors that seem to scream “Summer is here!” So we made it twice in one weekend, for two different dinner parties. Wash and rinse the quinoa. In a medium saucepan, bring the quinoa and water to a boil. Reduce to simmer, cover and cook until al the water is absorbed, about 10-15 minutes. Let cool. In a small bowl, whisk together the olive oil, lime juice, cumin and red pepper flakes. 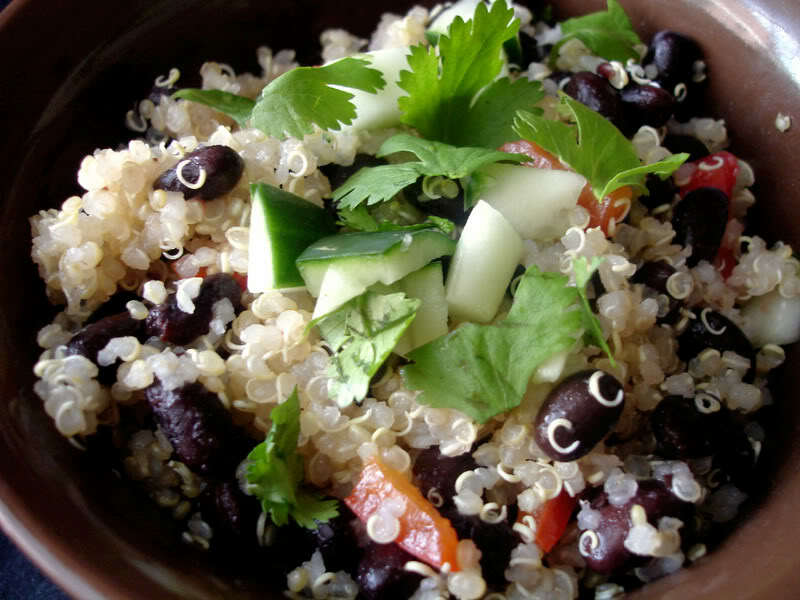 Combine cooled quinoa, black beans, tomatoes and onions in a large bowl. Drizzle the dressing over the salad and toss in the cilantro. Season with salt and pepper. Mix well. Chill and serve.